What is JO or Club volleyball? 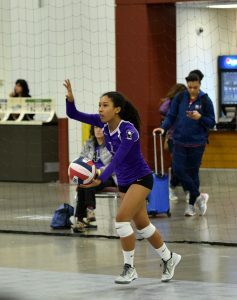 JO (Junior Olympic) or Club volleyball is the traveling side of volleyball. The season starts typically in December and ends between April (local teams) and June (national teams). 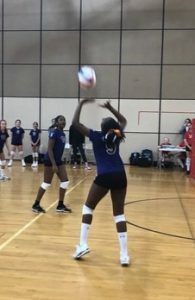 CLUB 43 is an Elite JO program, however, our U12 and purple teams are less competitive teams which are less intense, less of a commitment, and a great place for a player to start out in traveling volleyball. Our teams are formed through tryouts by age and skill. We take the top 10-12 players on our 1st team and form a 2nd team if there are enough players available. We may combine age groups to form the most competitive teams possible. Cuts are made at tryouts however we try not to cut any players U12 and under. Tryouts are in two separate age groups – U12-U14 are at the end of October and U15-U18 are in the middle of November. September 1st is the cut-off date for each age group – for example if you turn 13 before September 1st you would be a U14 player – this formula is used in all age groups. We begin practices at the end of November and play through April with our younger teams and June with our National teams. Our 1st teams and National will play a more competitive schedule than our 2nd teams and purple teams. We do have time off for Christmas and spring break. Practices will be held at the 43 Hoops Basketball Academy running 1-1/2 to 2-1/2 hours long twice a week. Our National teams are elite players from across the metro whose goal is to play college volleyball and their focus and commitment to the sports is at the highest level and they expect to win. Our purple teams are less competitive, less intense and the focus is to develop skill and be competitive. We are proud to say we are the ONLY CLUB IN THE COUNTRY WITH AN ALL FEMALE STAFF. We find it extremely important for women to empower women. Young girls need to see and work with strong, independent, athletic women to encourage them to achieve the same. Our coaches are passionate, committed and truly love being in the gym. We do not have equal playing time – we put the best players on the floor to be the most competitive we can be. However in the Molten Series or if a team is in the loser’s bracket of a tournament – coaches will relax this philosophy and play everyone as equal as possible by position. All practices, tournaments, and training are mandatory. We do have excused absences – illness, church, mandatory school events and funerals – but all other absences like birthdays, testing, vacation, sleepovers, driver’s ed, etc. – are not excused and may result in a loss of playing time. If players abuse our policies they could be dismissed from the club without a refund. Fees are based on the team level, length of season, travel schedule and age. Base club fees include: uniform top, spandex, warm-ups, practice tee, backpack, 2 pr of socks, knee pads, water bottle, practice time, paid experienced coaches, and tournament and player fees. For our National Teams travel expenses – housing, snacks and meals – will be covered for major tournaments. We do not provide transportation to tournaments except for U18’s GJNC Nationals in Dallas where flights and transportation will be covered in our fees. Many other clubs…. DO NOT cover travel expenses to out of state tournaments – please compare our fees to others – this expense alone will add $2000-$3000 to your total fees at other clubs.